UNCG faculty and staff are invited to the installation of Dr. Franklin D. Gilliam Jr. as the university’s eleventh chancellor. The ceremony will be Friday, Oct. 7, 2 p.m. in UNCG Auditorium. The keynote speaker is Robert K. Ross, M.D., president and CEO of the California Endowment, a foundation with $3 billion in assets, committed to expanding access to affordable, quality health care for underserved individuals and communities. Faculty and staff may RSVP at installation.uncg.edu/minerva. Seats are offered on a first-come, first-served basis. The ceremony will be livestreamed at https://installation.uncg.edu/livestream. Following the Installation Ceremony, the university will host an outdoor celebration in Foust Park for the campus community. Enjoy live music and food trucks as the community gathers to celebrate Dr. Gilliam’s installation and this historic day in the life of the university. Details may be found at installation.uncg.edu. Questions? Email rsvp@uncg.edu or call 336-334-4583. Excellence is a hallmark of UNCG. In this just-released fall issue of UNCG Magazine, enjoy stories of UNCG alumni, faculty, staff and students that highlight this excellence. Teach. Lead. Excel. On her way to national teaching honors — and an invitation to meet with President Obama at the White House — Leslie Ross ’97, ’08 MEd discovers her voice. And helps kids find theirs. Measures of excellence At UNCG, how is excellence measured? Sometimes with hard data and national honors. Other times, with personal transformation or impact on a community. Chancellor’s Installation The ceremony will be livestreamed Oct. 7. In the pines How old are many of the majestic trees on campus? Keith Watkins ’15 has done the research, and unveils the results. ‘Stars and Stripes Forever’ Dr. John Locke as John Philip Sousa, for special performances on campus. Class notes With pages of alumni photographs. ‘Old School’ Yum Yum, in its original location. Complementary clips Videos include award-winning educator Leslie Ross (seen in visual above); Keith Watkins and some of UNCG’s oldest trees; and Sara Pilling-Kellogg ’16 MPA and student Joe Rotondi, helping spur growth on downtown’s Lewis Street. New this issue! If you enjoy reading magazines on your iPad or Android tablet, download the free app for UNCG Publications. Or if you prefer, download the magazine as a PDF. Enjoy the Fall 2016 UNCG Magazine now. Dr. Henry Samuel Levinson, professor of religious studies, died in 2010 at age 61 from complications stemming from multiple sclerosis. But his spirit lives on. He was honored this past weekend as the Woven Works Park on the Downtown Greenway was officially opened. It is one of the cornerstones of the Greenway. Levinson was a professor at UNCG for over twenty-five years. He served as associate dean of the College of Arts and Sciences, head of the Department of Religious Studies, and director of the Center for Critical Inquiry in the Liberal Arts. In 1998, UNCG established the Henry Samuel Levinson Program Fund in Jewish Studies, including the Levinson Lecture in Jewish Studies series, in his honor, his obituary notes. Before joining the UNCG faculty in 1982, Levinson taught at Stanford and Harvard Universities. He was a Phi Beta Kappa graduate of Stanford and earned a doctorate from Princeton. Levinson family members were on hand for the dedication last Saturday. A speaker noted that due to MS, Levinson had used a wheelchair for the last decades of his life – and that the accessible features in the park were a wonderful tribute to Levinson. Visual: In 2009, Levinson was honored at “Henryfest,” where former and current students and colleagues honored him. ActiveU is back – now with more classes for UNCG employees. ActiveU fitness classes, beginning October 4, are free for UNCG employees, and attendance does not require a Kaplan Center for Wellness membership. New this year are 30 minute classes, available only for employees and held every Tuesday 12:15-12:45 p.m.
HealthyUNCG will host a kick-off event at the Kaplan Center at noon on the 4th to kick off Active U. There will be prizes for those who attend. “Open ActiveU” classes are also free to employees five days a week, morning, afternoon and evening. The classes include Boot Camp, Spin (Cycle), Yoga, HIIT Strength, Yogalates, Core, BodyPump and Aqua Fitness. Classes are unlimited and no advance registration is required. To attend a class, bring your employee ID card and let the front desk attendant know you are there for ActiveU. Check the Kaplan Center for Wellness Group Exercise Schedule for times and class descriptions. More information about employee fitness opportunities are at http://healthyuncg.wp.uncg.edu/programs/fitness/. Come celebrate the Weatherspoon Art Museum’s 75th Anniversary on Saturday, Oct 1. The party begins at 8 p.m. in the Weatherspoon. The Decade by Decade Dance Party will feature music by Jessica Mashburn and Evan Olsen, elevated savory and sweet hors d’oeuvres by 1618 Concepts, full bar and Crafted Cocktails by Knob Creek and Effen Vodka. There’s a special discount rate for UNCG faculty/staff. Discount tickets are $50 (normally, tickets are $75). Use code UNCGWAM. Faculty/staff may purchase tickets at the Triad Stage box office or visit weatherspoon.uncg.edu. Ticket supply is limited. Proceeds will help fund future exhibitions and acquisitions that will benefit generations of students to come and the community. UNCG’s School of Nursing website has a brand new look. Launched over the Labor Day weekend, the redesigned website offers quick and easy access to essential information and provides a more comprehensive understanding of the School of Nursing and the nursing profession. The website also offers up to date information about the nursing school’s programs and events, including its upcoming 50th anniversary celebration. Click here to view the updated website. Nor Othman (ELC, School of Education) was asked to serve on the Greensboro Historical Museum’s Advisory Committee for their upcoming Smithsonian Institute Travel Exhibit “I Want the Wide American Earth: An Asian Pacific American Story.” This six-month long exhibit that highlights the challenges and accomplishments of the many Asian communities here in Greensboro, as well as creating awareness about culture tolerance, started last Saturday. As part of the exhibit, she was interviewed by the museum about her experiences in America. In addition, some artifacts she is lending to the museum will be part of the exhibit’s display showcase. Dr. George Hancock (SERVE Center) received additional funding from the U.S. Department of Education for the National Center on Homeless Education. With over 40 years of experience in homeless education among its staff members, NCHE has concentrated its efforts since 1998 to be the primary national repository of expertise in homeless education and to operate a highly responsive and efficient technical assistance center customized to the unique needs of its stakeholders, the abstract notes. NCHE has honed its expertise not only as a technical assistance center, but as a technical assistance center specifically for building the capacity of educators and service providers who work to improve the education of homeless children and youth. Hancock is UNCG’s National Center for Homeless Education. Miles for Wellness, the UNCG Employees’ annual walking challenge, begins on October 3. Teams from UNCG compete with other teams all across the state on the quest to reach 10,000 steps per day. Last year, UNCG had 14 teams (140 employees) participate. Two of UNCG’s teams won state recognition. Super Hare Division – an average greater than 70,000 up to 105,000 steps per week per member. Bionic Hare Division – an average of greater than 105,000 average steps per week per member (this division is new this year). For UNCG staff member Jennie Rikkola, the State Employees Combined Campaign (SECC) is a way for her to not only make a difference in the local community, but to honor her mother. 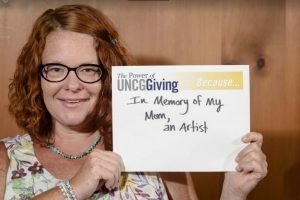 “This year, I am supporting ArtsGreensboro in memory of my mom,” said Rikkola, who serves as the assistant to the assistant dean in UNCG’s School of Nursing. “She was an amazing artist and passed her love of all things art to me. Rikkola has served as a volunteer solicitor with the SECC for 13 years. The SECC is an annual giving campaign that allows state employees to support a variety of charitable organizations in North Carolina. This year, UNCG hopes to raise $199,999 for charities across the state. UNCG employees can pledge online using ePledge or via the paper pledge form. The ePledge site can only be accessed through the link in the email that all employees received last week. For more information, visit secc.uncg.edu. UNCG will host a panel discussion titled “Immigrants and Refugees in Greensboro: Current Challenges” today (Wednesday, Sept. 28), from 4 to 5:30 p.m. in the Graham Building, Room 212. The panel will discuss the variety of challenges facing immigrants and refugees, focusing specifically on how gender and sexuality play prominent roles in the immigrant and refugee experience. The event is free and open to the public. Panelists include Audra Abt, associate to the rector at St. Andrew’s Episcopal Church; Raleigh Bailey, former director of the Center for New North Carolinians; David Fraccaro, executive director of FaithAction International House; Leilani Roughton, executive director of New Arrivals Institute; and Heather Scavone, director of Humanitarian Immigration Law Clinic. The panel is presented by UNCG’s Women’s and Gender Studies Program and is co-sponsored by the Office of Intercultural Engagement and the International and Global Studies Program. This fall, the College of Arts & Sciences is partnering with the Human Rights Research Network to host the Human Rights Film Series at UNCG. The film series is part of the year-long War & Peace Imagined event series at UNCG. Films in the series include: “Watchers of the Sky” – which was shown on Sept. 8 – “A Separation” (Sept. 29), “Pray the Devil Back to Hell” (Oct. 20) and “The Look of Silence” (Nov. 10). All films will begin at 6:30 p.m. in the School of Education Building, Room 120. A post-film discussion facilitated by different members of the UNCG community will follow all screenings. “A Separation,” the next film in the series, will be shown on Sept. 29. The film tells the story of one family’s struggles and desires in post-revolutionary Iran. UNCG history professor Jeff Jones will facilitate the post-film discussion. The series is free and open to the public. For more information on the film series or upcoming film showings, visit warandpeace.uncg.edu. Registration is now open for UNCG’s 2016 Three Minute Thesis (3MT) competition, and graduate students across campus are invited to register and participate. 3MT competitors are tasked with communicating their master’s thesis or doctoral dissertation research in three minutes to a non-specialist audience using just one PowerPoint slide. This year’s competition will take place on Thursday, Nov. 17, from 2:30 to 4:30 p.m. in the Alumni House. Registration is open to UNCG graduate students of all disciplines. In previous years, students have come from a variety of departments including Nutrition, Kinesiology, Biology, Counseling and Educational Development, English, Chemistry and Biochemistry, History and others. The competition, which started in 2008 at The University of Queensland in Australia, is held at universities all over the world. This is the fourth year that UNCG has hosted 3MT. This year’s winner will be awarded $1,000, in addition to travel and accommodations to the regional Conference of Southern Graduate Students (CSGS) competition. The second-place winner will be awarded $500, and the people’s choice winner will take home $250. Participation is limited to the first 60 UNCG master’s or doctoral students to register. For more information or to register, visit grs.uncg.edu/life-dev/3mt. On Sept. 29 at 6:30 p.m., in the EUC Maple Room, as part of National Recovery Month, UNCG’s Spartan Recovery Program will present the 2nd annual screening of the documentary “Anonymous People,” which will be followed by a panel discussion comprised of current students, SRP alumni, UNCG staff and family members and a collegiate recovery professional. Light refreshments will be served before the film, at 6:30 p.m., and after the film and discussion, at 8:45 p.m., there will be a candle lighting on the EUC front lawn to celebrate hope in recovery. UNCG Police Captain Ron Wolford, Associate Vice Chancellor and Dean of Students Dr. Brett Carter and Collegiate Recovery Coordinator for the Governor’s Institute Chris Campeau will join UNCG students and alumni as panelists. A program of the Student Health Services Counseling Center, SRP creates a network of recovery support services that promote the personal, academic and professional goals of students in recovery. For more information, visit shs.uncg.edu/about-srp. UNCG Staff Senate is collecting items for a special drive through the end of this week. The One Million Good Nights Pajama Program will collect pajamas and books for children in boxes around campus through Sept. 30. The boxes will be in the following buildings: Sink, School of Education, Mossman, EUC, Library, HRL office in Ragsdale, Sullivan Science, McIver, MHRA and Becher-Weaver. The goal of the national campaign is to provide one million children with a set of pajamas and a book. For questions or more information, contact Katie Geise at kngeise@uncg.edu. The first Let’sGoG show of the academic year has been posted. It’s produced by Athletics and presented by the UNCG Alumni Association. The fall sports seasons are heading into conference play – see the update on all the teams’ news. UNCG students, faculty, staff, alumni and community members gathered together on Friday, Sept. 16, to celebrate the official dedication of the Leonard J. Kaplan Center for Wellness. The event included a ribbon-cutting ceremony, the ringing of the university bell and an open house for the campus community. During his remarks, Gilliam expressed deep gratitude to the late Leonard J. Kaplan and his late wife Tobee Kaplan. In March, UNCG announced a $5 million gift made by Tobee Kaplan in honor of her husband. The gift, which created an endowment in support of health and wellness programs on UNCG’s campus, was recognized in the naming of the new wellness center. The Kaplans were widely known for the indelible mark they left on the community through their extraordinary record of philanthropy and leadership. Together they established the Kaplan Family Foundation (later renamed the Toleo Foundation), which has been active in furthering the causes of education, health, social services and community involvement. The Kaplan Center opened to students, staff, faculty and alumni members on Aug. 1. The facility features more than 20,000 square feet of weight and cardio space, seven basketball courts and a 54-foot climbing wall, among other wellness spaces and classrooms. The center also provides education on sexual health, mental health, sexual violence and relationships, alcohol and other drugs, nutrition and body image. Visual: Past and present campus leaders take part in the ribbon-cutting ceremony for the Kaplan Center. From left to right: Katie Marshall ’11, Isaac Miller ’12, Chelsea Boccardo ’13, Dr. Jill Beville, Chancellor Franklin D. Gilliam Jr., former Chancellor Linda P. Brady, Trustee David Sprinkle, SGA President Joseph Graham. Dr. Shan Suthaharan (Computer Science) has published a textbook, “Machine Learning Models and Algorithms for Big Data Classification,” which has been downloaded more than 22,000 and received a STAR rating by ACM, the major computing professional society. The book presents machine learning models and algorithms to address big data classification problems. It teaches readers about the field of big data and machine learning, and the book is well suited for both undergraduate and graduate students, in addition to new researchers and developers. The book can be accessed at: http://www.springer.com/us/book/9781489976406. Suthaharan serves as the Director of Undergraduate Studies in UNCG’s Department of Computer Science, and he has authored or co-authored more than 75 computer science research essays published in international journals. He also invented a key management and encryption technology, patented in Australia, Japan and Singapore. Dr. Terri Shelton (Office of Research and Economic Development) received funding from NC DHHS Division of Mental Health, Developmental Disabilities and Substance Abuse for the project “NC Preventing Underage Drinking Initiative.” The abstract states that, despite reductions, underage use of alcohol is still prevalent in North Carolina. Based on the most recent Youth Risk Behavior Surveillance System Survey (2015), 29.2 percent of middle and high school students drank alcohol in the past 30 days and 13.9 percent of high school students binge drank in the past 30 days. This contract will support the North Carolina Preventing Underage Drinking Initiative (NC-PUDI) in developing innovative strategies to prevent underage alcohol consumption and the resulting social, health and economic consequences. This continuing effort is designed to further support and develop environmental management strategies that prevent underage drinking, and to create a sustainable movement to stop practices that make underage drinking both easy and acceptable. Long-term outcomes include reductions in youth alcohol consumption, which will be tracked using the North Carolina YRBS and local data. Shelton serves as UNCG’s vice chancellor of Research and Economic Development. Dr. Yashomati Patel (Biology) received funding from the National Institute of Health (NIH) for the project “Mechanism of Myosin Action in Glucose Uptake.” Patel is associate professor and director of Undergraduate Studies of Biology. Her research concerns mechanisms regulating glucose homeostasis in relation to type 2 diabetes and breast cancer progression. Dr. Wendy McColskey (SERVE Center) received funding from Forsyth Technical Community College for the project “Improving Student Achievement through Faculty Development (Title III) Evaluation.” McColskey’s career with the SERVE Center has spanned more than twenty years, and during that time she has been responsible for many publications on classroom assessment and student-motivation and has directed the Regional Educational Laboratory-Southeast, operated by the SERVE Center. Her work informs critical educational decisions made throughout the Southeast. Dr. Melissa Floyd-Pickard (Social Work) received continued funding from the Center for Mental Health Services (SAMHSA) for the project “JMSW Behavioral Health Workforce Education Training Grant.” The Joint Master of Social Work Program (JMSW), offered by UNCG and NC A&T, educates future social work clinicians who are committed to social justice, diversity and inclusion. The program will provide stipend support to MSW students for experiential training, and will recruit incoming students intending to serve at-risk children, adolescents, and transitional-age youth. The program evaluation findings will be disseminated to appropriate audience through traditional methods, such as reports, articles, and presentations and non-traditional methods, such as a creative drama production. Dr. William Gerace and his colleagues in the Physics Education Research Group in the Department of Physics and Astronomy received new funding from the National Science Foundation for the project “Self-efficacy Intervention to Improve STEM Performance.” This award funds a research project to design, develop, test, and document a practical self-efficacy intervention to improve students’ self-efficacy and academic performance in STEM courses. Research shows that student self-efficacy, or a student’s belief about their ability to be successful in a specific domain, is strongly related to academic success. The SIISP project, Self-efficacy Intervention to Improve STEM Performance, will seek to improve students’ sense of STEM self-efficacy by creating an intervention which focuses on internal attributions and growth mindset. With research locations at UNCG and NC A&T State University, this three-year research project will design and test an intervention with the goal of providing a practical tool for STEM faculty to use to positively effect student self-efficacy and academic performance. Two UNCG offices are trading spaces. On September 30, the Financial Aid Office will be moving to the Mossman Building at the corner of Spring Garden and Stirling. They will be trading spaces with Human Resources. Financial Aid’s phone numbers and mailing address will remain the same. Office and phone assistance for the Financial Aid Office will be limited on Friday, September 30, and Monday, October 3. Please email finaid.uncg.edu with any questions you may have while they settle into their new location. On September 30, the Human Resources office is moving to 723 Kenilworth St., which currently houses Financial Aid. HR phone numbers and mailing address will remain the same. Human Resources will be closed on Friday, September 30, and will be open with limited availability on Monday, October 3. Please email hrs@uncg.edu with any questions you may have while they settle into their new location. The fall and winter dates for the UNCG Planetarium Show and the Three College Observatory (TCO) Public Nights are now listed. These shows are free, open to the community and appropriate for adults and older children. UNCG’s Spitz projector will project the stars, planets, sun, and moon onto the interior of a 20-ft dome on Oct. 14, Nov. 11, Dec. 9, and Jan. 13, with all shows at 7:30 p.m., in Petty Science Building, 310. This remarkable tool is used to reveal astronomical objects and patterns of motion. The TCO, located at a dark-sky location near Snow Camp, will have shows Oct. 7 at 8 p.m., Oct. 29 at 7:30 p.m. and Nov. 19, Dec. 2. and Jan. 21, at 7 p.m. This facility opened in 1981 and contains a 0.81-meter reflecting telescope, one of the largest in the southeastern United States. Although admission is free, seats are limited for both. The shows are popular; slots fill quickly. Reservations can be made through the UNCG Department of Physics and Astronomy website: https://physics.uncg.edu/. The first annual Business Affairs Expo will take place Tuesday, Sept. 27, from 11 a.m. to 1 p.m. in the EUC Cone Ballroom. The event will include exhibitions and demonstrations on power saving, office ergonomics, financial planning and digital signage. The Business Affairs department will share information about key initiative and available services. Samples from Spartan Dining and other light refreshments will be available. The campus community is invited. The SECC’s ePledge, the online giving system for the campaign, is officially up and running for UNCG faculty and staff. The SECC is an annual giving campaign that allows state employees to support a variety of charitable organizations in North Carolina. Employees can now pledge online instead of submitting a paper pledge form. All UNCG employees received an email on Monday with a link to the ePledge site. The ePledge site can only be accessed through the link in the email. Online pledging is designed for payroll deduction (to begin January 2017) or one-time credit card payment. Individuals who wish to pay by cash or check should complete the paper pledge form and submit it to their assigned solicitor. The Ashby Dialogues were created to honor the late Dr. Warren Ashby and his assertion that a university is “freedom in the search for and service of truth.” Every year, the UNCG program invites faculty and students from at least two academic departments to meet at least once a month to discuss crucial issues and to build a community of inquiry. This year’s fall dialogues have been curated by professors in the African American and African Diaspora Studies, Sociology and Anthropology departments. On Sept. 9 the series began at the Alumni House with “White Privilege and the Black Experience,” moderated by Dr. Robert L. Anemone, professor of Biological Anthropology and Paleoanthropology at UNCG. The second session will be Oct. 11, 5-6:15 p.m. in Curry Auditorium (225), when Mark Anthony Neal, professor in Duke University’s African and African American Studies department, will speak about race relations on North Carolina campuses. Dr. Tara T. Green, professor of African American and African Diaspora Studies at UNCG, will moderate the dialogue following the talk. The third session, “Race, Gender, Identity, and (In)visibility” will be on Nov. 1, 11 a.m.-12:30 p.m. This discussion will concern Claudia Rankine’s Citizen, a National Book Award finalist. The lyric essay presents experiences of daily life that are affected by racial injustice and police brutality. Students are asked to bring responses to the text, which may include poems, journal entries and video blogs. Dr. Shelly Brown-Jeffy, associate professor of sociology, will moderate this discussion. On Oct. 28 the Student Personnel Administration in Higher Education M.Ed. program at UNCG, with support from the North Carolina College Professional Association, will present its annual Careers in Student Affairs/ NextGenNC Conference at Elliott University Center. This conference will offer information and guidance to undergraduate and graduate students, as well as to professionals and those considering a doctoral program. The UNCG Office of Research Integrity will offer a two-hour session in human research protection on Tuesday, Oct. 25, 9-11 a.m., in MHRA 2711. The workshop will cover all required categories to meet the requirements of assurance with the Office of Research Protections, including areas such as confidentiality, informed consent, recruitment and the history of human research protection. This session is offered as an alternative to CITI training. Registration is available at http://workshops.uncg.edu/. UNCG’s Homecoming will hold its fourth annual 5K Saturday, Oct. 22, and you are invited to participate. Also new this year, the race will start and finish at the Plaza and UNCG’s award-winning Pedestrian Underpass. Parking on campus is free the day of the event and race participants are encouraged to park in the Oakland Deck. The race will begin at 9 a.m., and will be followed by a 10:30 a.m. awards ceremony and pancake brunch at the Leonard J. Kaplan Center for Wellness.